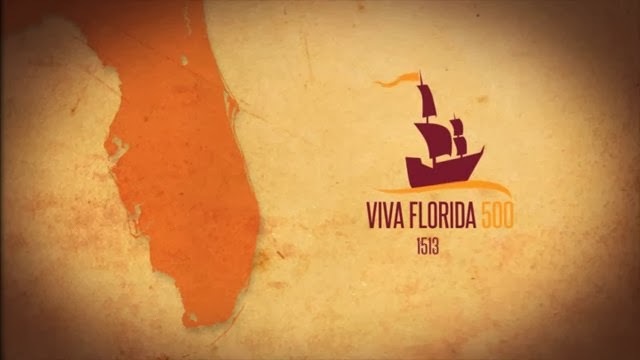 This year we celebrate the 500th anniversary of Juan Ponce de Leon voyage to Florida in 1513. Though it is likely Ponce de Leon was not the first European to visit Florida, his journey resulted in the name La Florida, and was the first to be well documented. Contrary to popular myth, it was not the fountain of youth that brought Ponce de Leon to Florida, but a royal contract which offered to make him governor for life of any lands he discovered. Ponce de Leon had served as provincial governor of Puerto Rico, before he was forced out of power by his rival Diego Colón, the illegitimate son Christopher Columbus. King Ferdinand II of Aragon hoped to reward Ponce de Leon for his service to the crown, while at the same time preventing Colón from gaining further influence in the New World. Ponce De Leon funded the expedition himself, outfitting three ships and bringing with him 200 men. Departing from Puerto Rico on March 4th of 1513, he reached the East Coast of Florida in early April, landing somewhere between St. Augustine and Melbourne Beach. After a few days on land, Ponce De Leon’s ships headed south and ran into the Gulf Stream. Passing through the Florida Keys, the expedition reached Florida’s West Coast on the 23rd of May. The explorers quickly found themselves at odds with the Native Americans they encountered, and several skirmishes broke out, which resulted in casualties on both sides. It is reported that at least one of the Natives they met already spoke Spanish. The Spanish took several captives, and went on to explore the Dry Tortugas and Grand Bahama in the summer of 1513. From here, Ponce De Leon turned back toward Hispaniola, returning to Puerto Rico in October, after an eight month expedition.